Jerry Maguire is a 1996 American romantic comedy-drama sports film starring Tom Cruise, Renée Zellweger, Cuba Gooding, Jr., and Kelly Preston. Cameron Crowe wrote, co-produced, and directed the film. Crowe says his original goal was to explore the themes of love and marriage in the 1990s. 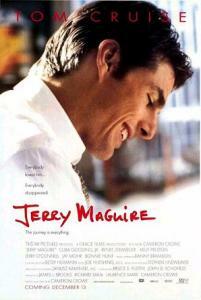 Jerry Maguire (played by Cruise) is a successful, charismatic 35-year-old sports agent whose current focus is on whoever stands to make him the most money. Dorothy Boyd (played by Zellweger) is a soft-spoken, conscientious 26-year-old accountant with endearing personal warmth and charm. A romance between Jerry and Dorothy at first seems unlikely. Jerry has taken note of Dorothy in the office (no attractive female escapes his notice), but he is engaged to Avery Bishop (played by Kelly Preston)—a female version of himself. And Dorothy, now a single mom, must be extra wary of players like Jerry. Two things happen to cause Dorothy to drop her guard. First, she overhears Jerry describing his seemingly romantic marriage proposal to Avery. Second, when Jerry distributes to the entire office a mission statement proposing that his agency focus less on money and more on personal relationships, she mistakenly concludes Jerry is an inspired, ethical leader with integrity. At the same time, soon after the mission statement incident, Jerry’s firm concludes he has gone soft and fires him. In Jerry’s moment of desperation, Dorothy is the only employee that chooses to leave her job and join him in starting a new agency. When Avery and Jerry break up after his derailment from the fast track, Dorothy quickly becomes Jerry’s new love interest. With that introduction, let’s break down the relationship between Jerry and Dorothy from a personality perspective. Jerry is a Politician (eagle-eyed, pointy-headed hippie puppy or ESTP) [Review Personality Traits]. Dorothy is a Prophet (psychic, bleeding-hearted tyrant turtle or INFJ). They are opposite in every respect of personality—orientation, perception, judgment, and attitude—and thus “complete” each other. Jerry’s outgoing sociability is central to his success in representing athletes. He is a super puppy (extroverted type) that is always surrounded by others, and is ridiculed for never being alone. Jerry is so focused on everything around him that he has failed to develop his inner self. When Jerry takes an interest in Dorothy, her sister sizes up the situation for what it is: “Dorothy, this is not a guy. It’s a syndrome. Early mid-life. Hanging on to the bottom rung. Dear God, don’t let me be alone.” Dorothy is cast as a stereotypical turtle (introverted type), an accountant. She is friendly but not outgoing. At one point she tells her sister, “I’ve had three lovers in the past four years, and they all ran a distant second to a good book and a warm bath.” That is a turtle talking. With the exception of an uncharacteristic late night epiphany that inspires the doomed mission statement, Jerry is an eagle eye (sensing type) through and through. He is practical, realistic, cunning, and pleasure seeking. Experience has taught him that people are not loyal and want only one thing—“show me the money.” Jerry is not inspired. He is not a dreamer. He is not an innovator. He sees the world just as it is, and he knows well that his work is not “show friends.” It’s show “business.” Eagle eyes distrust intuition. If a real-life Jerry had awoken in the night to an inexplicable urge to commit career suicide, he would have immediately dismissed this intuitive perception as heresy. By contrast, Dorothy is a psychic (intuitive type). She trusts her intuitions. She is idealistic and craves romance and inspiration. When Jerry comes by drunk one evening, Dorothy’s sister accurately observes, “this guy would go home with a gardening tool if it showed interest.” To which Dorothy replies, “I just want to be inspired.” Dorothy’s mistake is misjudging Jerry to be a psychic like herself. Jerry is a hippie (perceiving type). He is playful, spontaneous, and adaptable. And like all hippies, he craves excitement and seeks to avoid routine, both at work and at home. Dorothy is a tyrant (judging type). She is decisive and organized. When Jerry asks who will leave with him, Dorothy makes the decision on the spot to join him. She is an accountant, a job that demands routine, order and organization, and she demonstrates these abilities when managing Jerry’s finances. Unlike Jerry, she is comfortable with the unexciting routines of home life and child rearing. This brings us to the central conflict in the relationship. Dorothy is attracted to Jerry’s energy, charisma and good looks, but if she is to fall for him, she must first convince herself that she alone has the power to tame the spirited bronco so that he is true only to her. She instinctively knows that men like him cannot be trusted and may be incapable of true love. But what if Jerry is on his way to becoming a different and better man? As a Prophet, Dorothy’s calling is to help others realize their human potential. She can’t resist wanting to help Jerry become the man she thinks he wants to be. But she is at risk of taking on a Pygmalion project to make him the man she wants him to be. The morning after they make love for the first time, she tells her sister, “I love him! I love him for the man he wants to be. And I love him for the man he almost is.” Dorothy is a romantic. She loves Jerry with her whole heart and soul and she wants to be loved the same way in return. Her weakness is her blindness to external realities, such as the true nature of the sports agency business and Jerry’s lack of integrity and vision. Jerry is attracted to Dorothy’s good looks of course, but also her purity of heart and internal values of loyalty and integrity. He does not possess such values. Jerry’s cynical approach to the world has left him empty inside. At one point, he says to the audience, “I hated myself… no, I hated my place in the world.” Jerry is drawn toward Dorothy’s inner richness to compensate for his inner void. But notwithstanding his mission statement, Jerry the Politician is willing to use the most effective means available to achieve his ends, without regard for the best interests of Dorothy or her young son. He is a cunning negotiator who will “shoplift the pootie from a single mom” if it suits his desires. Moreover, his greatest psychological weaknesses are visionary insight and emotional depth. He can never fulfill Dorothy’s longing for an inspired and romantic lover—unless he changes. The magic of the movie is that Jerry does change—or does he? With only one client to his name, Jerry has no choice but to push Rod Tidwell (played by Cuba Gooding, Jr.) to become a better football player by playing with his heart instead of his head. Rod takes Jerry’s advice and is rewarded with a multi-million dollar contract for which he warmly thanks Jerry. Inspired by Rod’s loving relationship with his wife and family and Rod’s newfound passion on the field, Jerry is overcome with the feeling that he too wants love and passion in his professional and personal life. In the movie’s final and most memorable scene Jerry returns home to tell Dorothy, “I love you. You… you complete me.” Dorothy replies, “You had me at hello,” and the movie ends. We will never know for sure whether Jerry changed his spots in a Eureka moment of life altering emotional insight, but we strongly suspect not. Sorry Dorothy. The romantic relationship between Jerry and Dorothy exemplifies the “shadow” theory of attraction, in which a person is attracted to that which one has not developed, expressed, or lived out in oneself. Our psychological opposite represents the rejected, abandoned, or unlived half of ourselves. In our romantic partner, we are seeking the completion of ourselves by our opposite. The story suggests that opposites do indeed attract, but that psychics may be better off mating with other psychics.